One of the things I’ve been working on lately is the tactical AI. I wanted the AI to be better at coordinating attacks. The image above shows pathway and timing information created by the AI. (The numbers in tenths of a turn, so “17” means “1.7 turns”.) 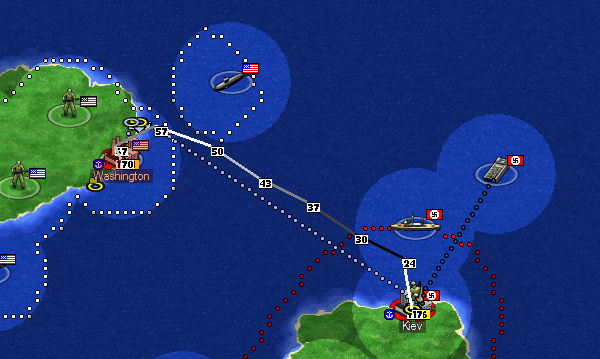 In this image, an infantry is being picked up by a transport in about 1.7 turns, rides inside the transport until around turn 5.7 and then moves into enemy territory. The timing information is useful for coordinating multiple units – so that it’s better at bringing all its transports simultaneously, moving combat ships into the area to protect transports, etc.